Gerugambakkam Chennai. Behind Elakiya Kalyana Mandapam & Bharath Petroleum Bunk. How Far is Ekadanta Flats? Strategically located in Gerugambakkam, Ekadanta Flats Apartments at Chennai is an exclusive lifestyle beyond imagination. Living spaces are designed to offer a scenic view of its natural surroundings. Location of Ekadanta Flats at Chennai is awe-inspiring, with infrastructure around being well-developed and everything within reach. The luxury lifestyle is where you should feel your dream come true in a compact space where you feel this is the perfect home. Ekadanta Flats developed with compact 1BHK Apartment in Gerugambakkam built with a better spacious plan, 2BHK Apartment in Gerugambakkam planned with 548 – 856 Sq. Ft. and with luxurious 3BHK Apartment in planned with carpet area sizes ranging from 984 Sq. Ft. 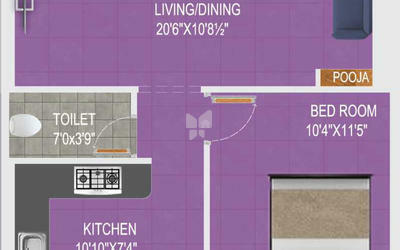 The unit options are well planned and executed to cater to the comforts of the residents. Excellent location, close to educational institutions, hospitals, shopping zone and other civic utilities. The area is one of the main residential hubs which has attracted the top builders in Chennai to own a project. People looking for homes either to invest in or to Live are easily satisfied by the infrastructure and trends of the locality. The locality also has the main things a person needs to live in Starting from Scratch to Ultra Luxury. Destined in one of the prime locations which allow easy access to the city and to the amenities nearby the projects. It has been a difficult decision thinking of where you could finally settle down peacefully. CPVC pipe for water supply and PVC pipe for waste lines. Three phase power supply with concealed wiring and semi modular switches of ISI standards. Madhuri Foundations is a reputed and respected name in the construction arena with several successful projects to our name we aim to be trendsetters in the business. Our reputation has been built on the strong foundation of service, quality, and punctuality. We have apartments and flats in prominent locations in Chennai. 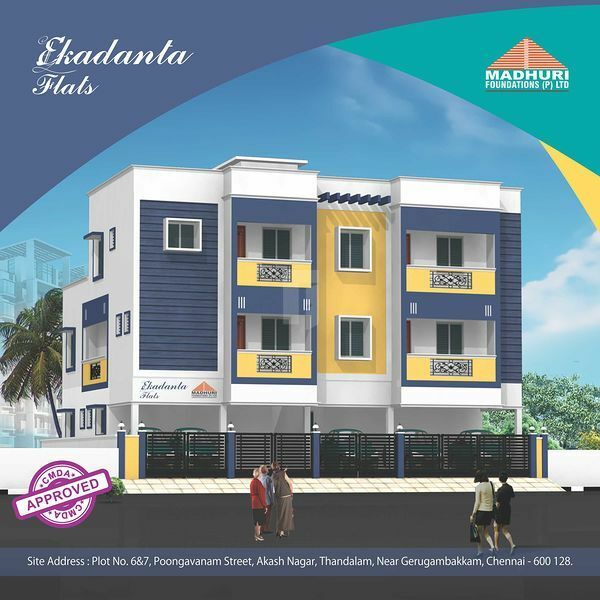 The Ekadanta Flats planned with 1,2,3BHK in Porur being destined to satisfy First-time homebuyers. The builder has been developing homes to satisfy people who are searching for Affordable Housing. The Sabari Flats one of the compact planned homes destined for Gerugambakkam, Chennai.